The road to weed legalization has been full of pot-holes for decades. With those now being filled by tax revenue from the legalization of the plant, many states are now toying with the revolutionary idea of allowing a legal industry. Most people are aware of the states that have already taken it there. What started in 2012 with Colorado and Washington state, quickly evolved to include Oregon, Alaska, California, Nevada, Massachusetts, Maine, and Washington D.C. Turns out that whole 2012 thing wasn’t a fluke, and more and more states are now putting a fresh set of eyes on their outdated laws. There are two different paths to cannabis legalization available in the United States. Some of the states employ ballot initiatives that put legalization in the hands of voters, while the others work through the process within their state legislature — passing the house, senate, and ultimately requiring the signature of the governor. 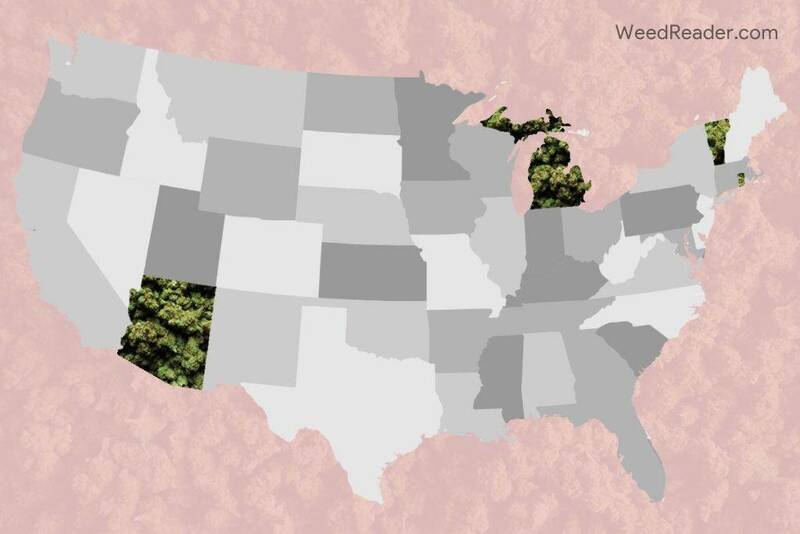 Since hope of federal legalization from our current administration looks bleak, here’s a breakdown of the states we have the highest hopes for in 2018. There’s potential for a lot of progress in other states as well, but these are some of the best shots. As a medical state that shares a border with the recently legalized state of Massachusetts, the potential loss of revenue could spur the legislature to make a bold move. The house and senate delivered a legalization bill to the desk of their governor in 2016, which he chose to veto. People are still pissed and it’s close to Massachusetts, so progress here is a good possibility. Voters voted on Prop 205 in 2016 and it received 48.7 votes in favor. This close of a call means we could definitely see them inch over the finish line in 2018. So close, yet so far away. They turned in over 340,000 signatures back in 2016—qualifying the measure for the ballot—only to be denied because signatures over 180 old were not considered valid. The 2018 showdown should be epic. If you’re a voter in any of these states, get involved and make your voice heard. Should you find yourself in one of those never gonna happen states like Idaho or Louisiana, we suggest finding local representatives that align with your beliefs and engaging in some good ol’ fundraising and campaigning. This post was originally published on: Pushmag.